Compatible Headphones Beats Solo3 Wireless On-Ear Headphones Beats Solo2 Wired / Wireless On-Ear Headphone Beats Solo HD On-Ear Headphone Beats Studio 2.0 Wired /Wireless OverEar Headphone Beats Studio Wired Over-Ear Headphones (Studio 1Gen) Beats By Dr Dre Wireless Headphones Beats Mixr On-Ear Headphon Beats Pro Wired Over-Ear Headphone Beats Pill+ Beats Pill 2.0 Portable Speaker If you are not sure whether fit your headphone, pls feel free to contact us. In-Line Remote Functions - Answer / hang up phone calls - Adjust high / low music volume - Select previous / next music track for iPod and iPhone Package Contains:(1x) Replacement Audio Cable with Mic (Headphone is not included) Material: - Compatible to Apple iPhone 3GS / 4 / 4S / 5 / 5S / 6 / 6 plus Remote function only work on Apple iPod, iPad, iPhone NOT for Samsung or Non Apple devices 30-Days Satisfaction Guarantee If you're not satisfied for any reason,contact us to receive refund or exchange. The product is NOT made by the Beats Inc. It does not bear any trademarks that are owned by the Beats Inc. and the seller is NOT affiliated with the Beats Inc.in any way! 100% CUSTOMER SATIFACTION: We will back for all of our customers even after our granteed date. We're always willing to listen to your concerns! So please do not hesitate for a moment to contact us . New Version Original Replacement Audio Cable Cord Wire with In-line Microphone and Control + Original OEM Replacement Leather Pouch/Leather Bag for Beats by Dr Dre Headphones Solo/Studio/Pro/Detox/Wireless/Mixr/Executive/Pill (White) - After market Beats RemoteTalk replacement audio cable designed for Beats by Dr. Dre headphones and Apple iPhone - Feature In-line remote control unit and Built-in microphone for music and phone calls Compatible Headphones (but not limited to): - Beats by Dr. Dre Studio 2 - Beats by Dr. Dre Studio Wireless - Beats by Dr. Dre Solo 2 - Beats by Dr. Dre Solo 2 Wireless - Beats by Dr. Dre Mixr - Beats by Dr. Dre Pro In-Line Remote Functions: - Answer / hang up phone calls - Adjust high / low music volume - Select previous / next music track for iPod and iPhone - Activate Siri or Voice Command Compatible Smartphone: - iPhone 3GS, 4, 4S, 5, 5S, 6, 6 Plus - Other Smartphones with an 3.5mm audio output Specification: Cable Length: 1.4 meter(4.6ft) Connectors: (1x) male straight 3.5mm, (1x) 90 degree "L" shape 3.5mm Package Contains:(1x) 1.4 meter - Stereo Audio Cable with built-in Microphone / In-Line Remote Switch. (1X) High quality Leather PU pouch. Oldboytech 3.5mm Premium Auxiliary Audio Cable-A combination of incredible sound, durability and universal compatibility make this one of the real choice for those serious about audio. 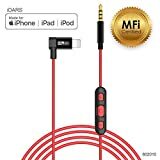 Universal Compatibility, Connect Any Device 3.5mm Audio Cable is compatible with all digital devices (phones, headphones, tablets, laptops, in-car stereos, mp3 players, portable speakers and more) with standard 3.5mm aux port. Plug in and play your sound. 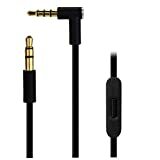 Superior Sound Quality-Hi-Fi Stereo Performance The male-to-male stereo audio cable transmits audio in stereo format. 24K gold-plated contacts ensure the cleanest sound experience possible. 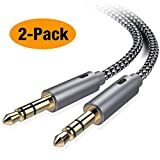 8 Feet/2.4M Double-Braided Nylon Aux Cord- Super Durable and Flexible Double-braided nylon exterior prevents tangling and adds another layer of durability, life is 5 times greater than original audio cables. Beveled Step-Down Design-Superb Fit Connector of oldboytech audio cable has been slightly extended to fit more devices model and phone cases. Its intelligent step-down design provides a secure fit with phones while case on. 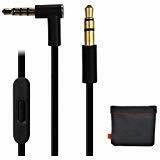 Compatible Devices Include: (Partial List) - Phones with a 3.5mm aux port: iPhones, Samsung Galaxy/Note, Sony, HTC, Motorola, Nexus, Nokia, LG, Blackberry and many more - Headphones: Sony MDR-1A, (NOT Incompatible with Beats Solo/Solo 2/Solo 3 ), SkullCandy Hesh 2, Oppo PM-3 - Portable Wireless Bluetooth Speakers: Sony, Beats, Echo Dot, JBL Pulse 2/Flip 3/Go, Bose SoundLink Mini Bluetooth Speaker - Tablets & Laptops: iPad, Macbook Air, Macbook Pro, Surface, Kindle fire, Samsung - Other: iPod, Mp3 players, computers, Walkman, Hi-Fi stereo sound systems, wireless audio receivers, radios Lifetime Warranty Unconditional Lifetime Replacement if there is any dissatisfaction with our auxiliary cables, please contact us firstly. 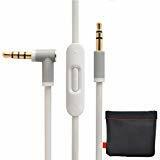 Replacement audio cable cord with in-line remote & microphone + replacement leather pouch bag for Beats by Dr Dre Headphones. Features: Compatible with Beats Studio, Executive, Mixr, Solo HD, Solo, Wireless, Mixr and Pro Headphones. Audio cable featuring built-in remote microphone for use with your smartphone, iPod, iPad or tablet. Two male plugs: one straight & one "L" shape. Cable length 1.2m (3.5mm to 3.5mm Jack). 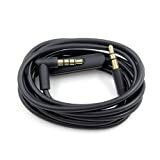 In-line microphone control give you hands-free calls and easy operation for your music Soft, tangle-free and durable cable; it comes with an replacement leather pouch bag for the cable. Compatible for Beats by Dr. Dre: Studio Studio 2 Solo Solo 2 Mixr Pro In-Line Remote Functions: Answer/hang up phone calls. Adjust high/low music volume. Select previous/next song. Compatible with: iPhone 5S, 6, 6plus, 6s, 6splus. iPod. iPad. Samsung Galaxy Note 5, 4, 3 and others; S3, S4, S5, S6edge and others. Other smartphones with an 3.5mm audio output. Tablets. Specifications: Cable Length: 1.2 meters. Connectors: 1 x male straight 3.5mm Jack; 1 x 90 degree "L" shaped 3.5mm Jack. Package Includes: 1 x Audio Cable with built-in Microphone / In-Line Remote & Microphone. 1 x Replacement Leather Pouch Bag . Apple MFi Certified MFi certification means QUALITY GUARANTEED. NO damage to iPhone, NO error message popping up. 100% Compatible with iOS 10 or later X/ XS/ XS MAX/ XR, iPhone 8/ 8 Plus, iPhone 7 / 7 Plus / 6s / 6s Plus / 6 / 6 Plus / 5s / 5c / 5, iPad Air / Air 2, iPad mini / mini 2 / mini 3 / mini 4, iPad (4th generation), iPod nano (7th generation) and iPod touch (5th generation). 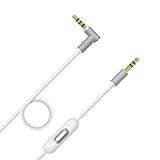 L-shape Lightning connector design L-shape Lightning connector design allows your iPhone fitted plug-in, Use an existing pair of 3.5mm Headphone (Jack) for Beats Solo2, Solo3, and Beats Studio, Studio2. Premium Material & Sound Quality This item is dedicated to enable you play audio from your iPhone on your car stereo, headphone, Hi-Fi, bluetooth speaker with 3.5mm aux ports. Delivers Premium Sound with fine-tuned acoustics that balance strong bass, soaring highs, and clear mids. With No Distortion. Hands-Free Phone Call & Music Control You can use the in-line button to answer/end phone calls and music control. The microphone allows you to communicate hands free, so that you can keep on your work. You can also easily play/pause, skip music tracks, and volume control through the remote button. No need to take out your phone from pocket or arm band any more. iDARS Warranty & Tech Support 12 Months Warranty and Life-Time Technical Support. If any questions, welcome to contact iDARS Customer Service. *Note: Not recommend to use it as handsfree in Car, Home Stereo or Speaker. Warranty: Not Satisfied=Money Back ! ! ! If you're not satisfied for any reason, contact us to receive refund or exchange! 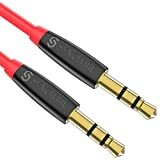 KAPON Headphone Cable Replacement Wire with In-line Microphone and Control For Beats by Dr Dre Headphones Solo/Studio/Pro/Detox/Wireless/Mixr/Executive/Pill. Compatible Headphones: Beats Wireless Headphone Beats Solo HD, Solo 2 Wireless, Solo 3 Wireless headphones Beats Studio 1Gen, Studio 2.0 Wireless headphones Beats Pro headphones Beats Mixr headphones Beats Detox headphones Compatible to Apple iPhone 3GS / 4 / 4S / 5 / 5S / 6 / 6 plus Remote function ONLY work on Apple iPod, iPad, iPhone NOT for Samsung or Non Apple devices. In-Line Remote Functions: - Answer / hang up phone calls - Adjust high / low music volume - Select previous / next music track for iPod and iPhone Package Contains: 1 X Replacement Audio Cable(Headphone not included) The Product is not made by Beats corp, it does not bear any trademarks that owned by Beats corp and the seller is not affiliated with Beats corp.